First and foremost, who is the recipient of the judgments in this chapter? The first fifteen chapters present a lot of evidence that the target of God’s wrath was Israel, or more specifically, the capital city of Jerusalem. However, some Preterists say there may be evidence that Rome was the target. One expositor in particular, Jay Adams, breaks up Revelation into essentially two sections. He then points out that the bowl judgments seem to parallel the trumpet judgments. He states that the trumpet judgments are meant for Israel, and the bowl judgments are meant for the Roman Empire. David Chilton, Kenneth Gentry, and others believe that first-century Israel is designated for judgment throughout the entire book, with the exception of judgment upon the beast in Rev. 13:10, 16:10, and 19:20. Here in verse 1 we see that the seven angels are told to “pour out on the earth the seven bowls of the wrath of God.” In our study of Revelation so far, we have suggested that many of the references to “the earth” in the book of Revelation are not meant to be taken as worldwide in scope, but as dealing instead with the land of Israel/Palestine. In a 3-part study on this subject beginning with this post, I have outlined nearly 20 instances where this appears to be the case. The trumpets and bowls do have distinct differences. The effects of the trumpet judgments are often only partial (affecting one-third of the earth, trees, green grass, sea, ships, springs of water, the sun, moon, and stars–see Revelation 8:6-12), whereas the effects of the bowl judgments are total. The bowls are associated with the seven last plagues, as seen in Revelation 15:1. A likely scenario is that “the trumpets depict preliminary calamities that fall upon Israel during the Jewish War, while the bowls present plagues associated with the final and utter devastation of Jerusalem” (Steve Gregg, p. 360). First bowl (verse 2): This plague was likely symbolic, though there is evidence that literal boils and rashes were present due to the lack of proper sanitation in the besieged city (Jerusalem, especially during the final five-month siege from April-September 70 AD). Remember, there were thousands of dead bodies and streets were filled with blood and sewage, making disease rampant. It can be seen that in verse 11, the people were still afflicted as they remained unrepentant of their sin and rejection of Christ. It should be noted that the plagues in this first bowl judgment parallel the plagues that Moses brought down on Egypt in Exodus 9:8-12 (See Appendix 1 below for more such parallels). Also a striking coincidence is that this is the same warning that Moses gave to the people of Israel if they were to become disobedient and unfaithful to His covenant (Deuteronomy 28:27, 35). In early spring 67 AD, which was 3.5 years before Jerusalem’s final downfall, Vespasian first entered Judea with a 60,000-member army. In the campaign which was to follow he destroyed at least 150,000 inhabitants of Galilee and Judea, along with many towns. One of the first towns Vespasian crushed was Joppa, because its inhabitants had provoked his men by their frequent piracies at sea. The Jews there tried to flee from Vespasian on their ships, but Vespasian was helped by a tremendous storm that blew in just as they began to flee. Their vessels were crushed against each other and against the rocks, and when this slaughter was complete more than 4,200 bodies were strewn along the coast and a very long stretch of the coast was stained with blood. The Romans then hoisted their own idol-covered banners at every key point of the temple area, and plundered and burned the houses in the city. They murdered by the sword every Jew they could find, man, woman, and child. Their only compassion was for the dead, whom they encountered in mass numbers in many of the houses, mostly victims of the famine. Josephus writes, “But although they had this commiseration for such as were destroyed in that manner, yet had they not the same for those that were still alive, but they ran every one through whom they met with, and obstructed the very lanes with their dead bodies, and made the whole city run down with blood, to such a degree indeed that the fire of many houses was quenched with these men’s blood” (The Wars Of The Jews, 6:8:5). Now, this destruction that fell upon the Jews, as it was not inferior to any of the rest in itself, so did it still appear greater than it really was; and this, because not only the whole of the country through which they had fled was filled with slaughter, and [the] Jordan [River] could not be passed over, by reason of the dead bodies that were in it, but because the Lake Asphaltitis [the modern Dead Sea] was also full of dead bodies, that were carried down into it by the river. And now, Placidus…slew such as had fled to the lake, insomuch that all Perea had either surrendered themselves, or were taken by the Romans, as far as Macherus (Josephus, “Account of the Lake Asphaltitis,” War of the Jews 4:7:6). Verse 6 seems to point to Jerusalem in A.D. 70 instead of Rome. The killing of the prophets was among the great sins of Israel (This can be seen, for example, in 2 Chronicles 36:15-16, Luke 13:33-34 and Acts 7:52). Jesus named this fact as the very reason that the symbolized blood of the righteous would be poured out in judgment upon that generation which heard Him speak (Matt 23:31-36) (Gregg, p. 366). More is said on this in our study of Revelation 17:6 and also Rev. 18:20, 24. Fourth bowl (verses 8-9): These verses probably need to be taken symbolically, as there is no record of increasing heat that was both dangerous and scorching to the people during this time. The sun in this instance is seen “as a symbol of mighty political and religious leaders…or refers to the oppression and tyranny exercised by the leaders of the Zealot sects that terrorized the citizens inside the besieged city of Jerusalem,” assuming Jerusalem was the intended target for this judgment. If Rome is the target, then this judgment “may represent the tyranny of Roman leaders or the ruthlessness of the gothic and Vandal kings that attacked Rome and brought about her downfall [in 476 AD]” (Gregg, p. 368). God declared that He would judge an unfaithful Israel in this way (with scorching), as seen in Deuteronomy 28:22. “Although most of the judgments throughout Revelation are aimed specifically at apostate Israel, the heathen who join Israel against the Church come under condemnation as well. Indeed the Great Tribulation itself would prove to be “the hour of testing, that hour which is to come upon the whole world, to test those who dwell upon the Land” (372). The darkness referenced here which comes upon the throne of the beast (i.e. Rome) is symbolically taken to be the political turmoil and overthrow of its leaders, in particular when Nero (the beast in the singular sense) committed suicide in 68 A.D. Upon his death, the Roman Empire quickly began to crumble, and the following year (69 A.D.) became known as the “Year of the Four Emperors” because of the rise and fall of four more leaders in Rome – Galba, Otho and Vitellius, all of whom reigned for eight months or less. Those expositors who see the second half of Revelation as pointing to the fall of the Roman Empire refer to these verses as pertaining to the invasions which led to the ultimate fall of Rome in the fifth century. Sixth bowl (verses 12-16): The great river Euphrates is represented in this bowl judgment just like it was in the sixth trumpet judgment. (The drying up the river was the strategy of Cyrus the Persian, the conqueror of historical Babylon in 536 B.C. The river was diverted away from the walls of Babylon, and this allowed his army to march under the wall and overtake the city and its king, Belshazzar, without much resistance.) Here, the Babylon of Revelation is seen by some to be Rome and this bowl judgment to be the downfall of the Roman Empire in the fifth century A.D. (Gregg, p. 378). Other writers see the Babylon of Revelation again pointing to Jerusalem and its related destruction in 70 A.D. God helped his people Israel through the drying up of the Red Sea (Exodus 14:21-22) and the River Jordan (Joshua 3:9-17; 4:22-24). It is ironic that God is now using this same type of judgment against Israel, the new Babylon which is invaded by a new Cyrus (all the while miraculously saving the true Covenant people). History tells us that this vision mirrors the return of Vespasian’s armies (now led by his son, Titus) bringing in reinforcements, and Josephus writes that these reinforcements came from the region of the Euphrates in the east (Gregg, p. 380). Coming from the mouth of the devil (the dragon) were three unclean spirits like frogs, a parallel to the second Egyptian plague (Ex. 8:1-15). “Natural Egypt was judged with natural frogs, and spiritual Egypt (Israel) was judged with spiritual frogs” (p. 380). In a similar fashion, the word “Waterloo” has garnered a symbolic use. Back in 1815, this town in Belgium was the battleground and scene of Napoleon’s final defeat. Today, we have a saying that some one or some thing has met their “Waterloo.” We don’t mean they have met that city in Europe. We mean, by way of comparative imagery, that they have met a decisive or crushing defeat, or their demise. I suggest Revelation employs the word Magedon/Megiddo in this same manner. History records that a great slaughter took place on a mountain in Palestine within the lifetime of the original recipients of the book of Revelation. In A.D. 70 the Roman armies of Titus totally destroyed Jerusalem and the Temple. According to Eusebius, 1.1 million Jews were killed. In verse 15, Jesus tells us that He is coming like a thief. This parallels His words to the Laodiceans, stating that they should buy white garments (see Rev. 3:18), and also His similar words to the people of Sardis (see 3:5). Jesus told His disciples that some of them standing with him “shall not taste death” before they “see the Son of Man coming in His kingdom” (Matt. 16:28). This could not have been fulfilled much later than A.D. 70, since most of the generation of disciples would have died by that time. This “coming” of the Son Man could refer to the judgment upon Jerusalem (384). If interested in a more detailed discussion of whether or not Christ came in judgment upon Jerusalem in 70 AD, please see this post here and also this post here. Seventh bowl (verses 17-21): Again, which city is this judgment falling on, Jerusalem or Rome? Steve Gregg notes that some Preterists see Revelation 11:13 and 16:19 as concrete evidence that Revelation chapters 4-11 refer to the judgments on Jerusalem (Israel) and that chapters 13-19 refer to the fall of Rome. If referring to Rome, this bowl judgment would have been consummated in 476 A.D, the year pagan Rome fell. There is more evidence, however, to support the idea that the great city is referring to Jerusalem, and its fall in 70 A.D. The following post on Revelation 17 will get into this evidence in much more detail. Verse 18: We are told that there was a great earthquake, greater than any other in history. The writer of Hebrews notes that a great earthquake in both heaven and earth would take place with the dissolution of the Old Covenant (Heb. 12:26-28, also see Heb. 8:13). As we saw in Rev. 4:5, 8:5, and 11:19, the cosmic phenomena here (“flashes of lightning, rumblings, peals of thunder“) mirrors the phenomena that occurred when Moses delivered the Law to the Israelites on Mount Sinai (Exodus 19:16). The significance of this parallel is that Jerusalem’s destruction (along with the temple) completed the transition from Judaism (the Old Covenant) to the New Covenant. All above the age of seventeen were sent in chains into Egypt, to be employed there as slaves, or distributed throughout the empire to be sacrificed as gladiators in the amphitheatres ; whilst those who were under this age, were exposed to sale. This refers to the division into three factions, which became acute after the return of Titus. While Titus was besieging it from without, the three leaders of rival factions were fighting fiercely within: but for this the city might have staved off defeat for a long time, even perhaps indefinitely, for no great army could support itself for the long in those days in the neighborhood of Jerusalem; there was no water and no supplies. The fighting within the city delivered it quickly into the hands of Titus (Gregg, p. 393-94). The three factions were led by  Eleazar, who was over the Zealots  John of Gischala, who was over the Galileans, and  Simon, who was over the Idumeans. It remained this way until the city was destroyed. The conditions were awful. In one night 8500 people were killed, and their bodies were cast outside of Jerusalem without being buried. The outer temple was “overflowing with blood” (says Josephus) and the inner court even had large pools of blood in it. Homes and gravesites were looted. 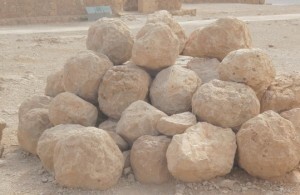 The 10th Legion of the Romans begins to launch white boulders as heavy as 100 pounds over the city walls into Jerusalem. They are cast by catapults from Roman engines from a distance of up to two furlongs (a quarter mile) away. Josephus records that the watchmen on the wall, if they saw them coming, would shout, “The Son cometh!” (Wars 5.6.3). After a while the Romans learned to blacken the stones so that they couldn’t as easily be detected, and thus many were crushed by these stones. The Seventh Trumpet was the sign that ‘there shall be no more delay’ (cf. 10:6-7). Time has run out; wrath to the utmost has now come upon Israel. From this point on, St. John abandons the language and imagery of warning, concentrating wholly on the message of Jerusalem’s impending destruction. As he describes the City’s doom, he extends and intensifies the Exodus imagery that has already been so pervasive throughout the prophecy… St. John’s more usual metaphors for the Great City are taken from the Exodus pattern: Jerusalem is not only Egypt [Rev. 11:8], but also the other enemies of Israel. He has shown us the Egyptian Dragon chasing the Woman into the wilderness (Chapter 12); a revived Balak and Balaam seeking to destroy God’s people by war and by seduction to idolatry (chapter 13); the sealed armies of the New Israel gathered on Mount Zion to celebrate the feasts (Chapter 14); and the saints standing in triumph at the ‘Red Sea,’ singing the Song of Moses (chapter 15). Now, in Chapter 16, seven judgments corresponding to the ten Egyptian Plagues are to be poured out on the Great City. There is also a marked correspondence between these Chalice [Bowl]—judgments and the Trumpet—judgments of Chapters 8-11. Because the Trumpets were essentially warnings, they took only a third of the Land; with the Chalices, the destruction is total. APPENDIX 2: WAS FLAVIUS JOSEPHUS FAMILIAR WITH THE APOCALYPSE OF JOHN? The reason for this is that a few short sections later after Josephus’ words quoted above, still speaking of this same event, he adds, “[Taking advantage of the noise of the storm, some of the Jewish zealots cut the bars of the temple gates with temple saws, allowing the Idumaeans to come in and join them in slaughtering some of the people]. The din from all quarters was rendered more terrific by the howling of the storm. And by daybreak they saw 8,500 dead bodies there” (Wars of the Jews 4:5:1). This occurred in 68 AD. Josephus does not attribute a certain number of deaths to the earthquake, and a certain number of deaths to the warfare which took place, but only notes that a total of 8500 dead bodies were discovered the morning after this earthquake. This is remarkably close to the Biblical account (i.e. it’s entirely possible that 7000 were killed due to the earthquake, and 1500 due to the warfare). These things were discussed here. Our study of Revelation 17 (Part 1) can be found here.